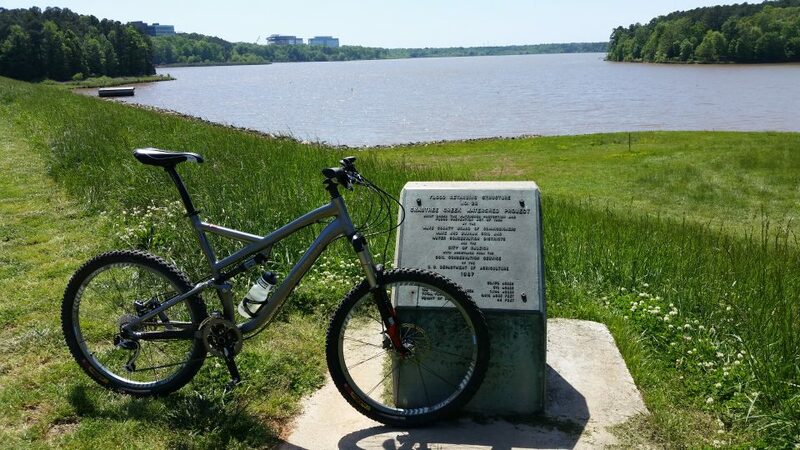 The next trails I rode in my quest to earn Oak City Cycling Project‘s Tetractus Bike Challenge patch were Lake Crabtree County Park’s multi-use trails and Harris Lake County Park’s Hog Run Trails. Both of these trail systems are fairly well known. On the Tetractus list, one could argue they are the closest trails to most people who live the Triangle. Even though my house sits between these two trail systems, I must admit I hadn’t ridden them in several months. I’ll blame the short days of winter, a wet spring, busy schedule, and lack of inspiration. 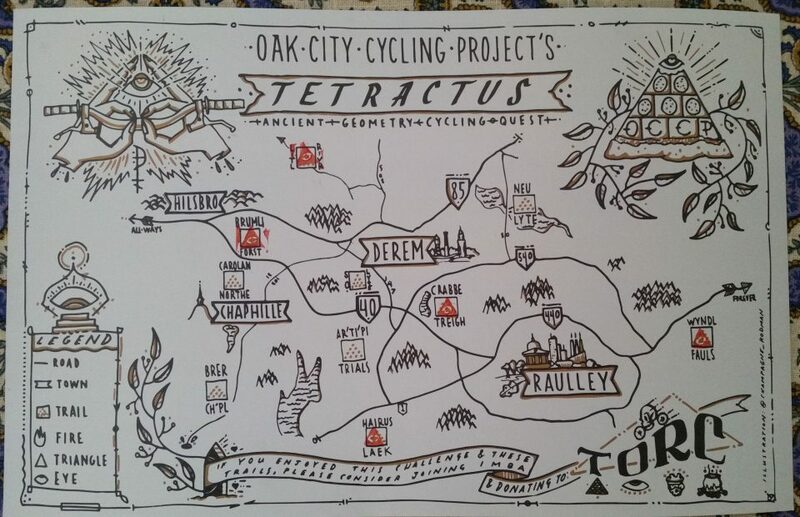 I’ll credit the Tetractus Challenge for motivating me to get out and ride them again! TORC’s trail maintainers have been busy on these trails. They have a few surprises in store for anyone who hasn’t ridden them in a while. Most of them are good surprises! 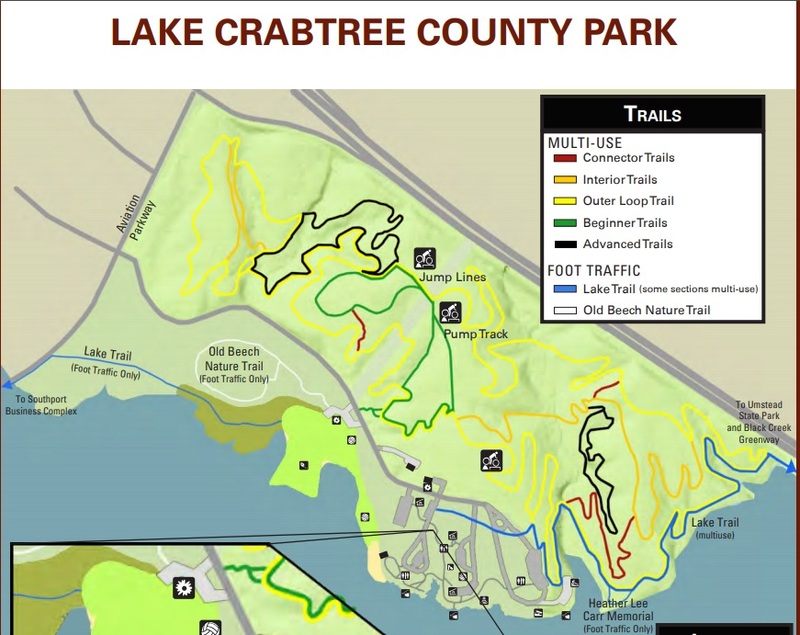 Lake Crabtree County Park‘s trail layout has always been a little confusing to me. At one time there were five numbered loops and several connectors. You needed to determine your route ahead of time or follow a buddy who had, or you might find yourself stopping for some decision-making several times during the ride. 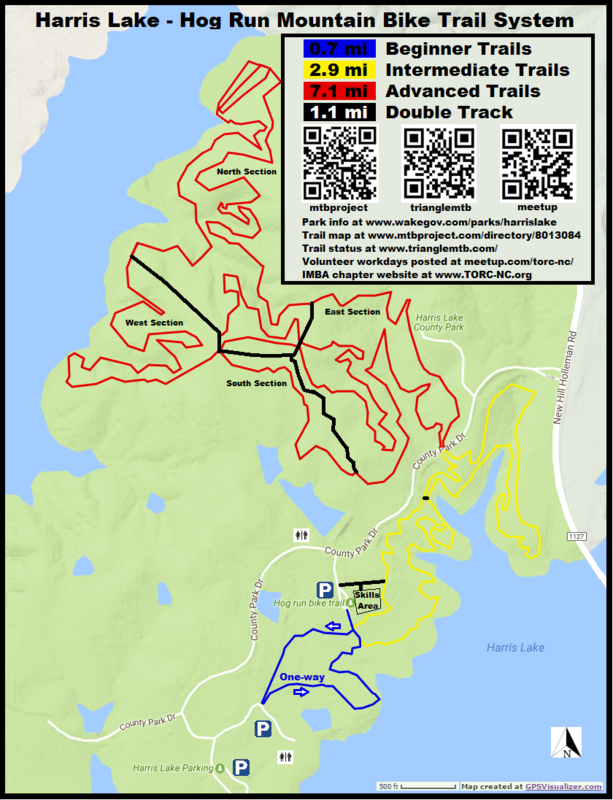 Now the trails are signed and mapped for Beginner, Outer (intermediate? ), and two Advanced loops, with several Connector trails, some Interior trails, and the pump track and jump lines. Some of these loops overlap. Surprise! My confusion is no worse than before. At least it’s new confusion. The trail maintainers deserve kudos for their efforts. 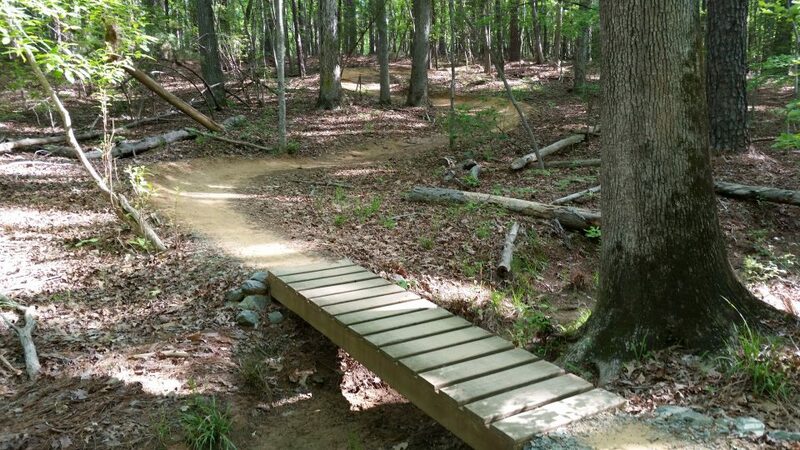 The Crabtree trails get a lot of use and one of my memories from last year was that the trail tread was getting quite rooty due to wear erosion. I found the trails to be much less rooty this time. I’m sure this is due in large part to the trail maintainers’ efforts. There are still a few very rooty stretches, but overall the trails are pretty smooth and flowy. Looking across from the Lake Crabtree dam towards the park (right side). Despite skipping a few of the sections due to my route choices, I still ended up riding about 9 miles. The park brochure claims 9.4 miles of multi-use trail. The trail maintainers have also been busy at Harris Lake County Park. The last time I rode Harris the South Section trail was fairly new. I was pleasantly surprised to find additions to both the Intermediate and Advanced trails. Those additions include more than just trail mileage. The builders created lots of bermed curves, bumps and dips, and rock armoring in low spots to make it even more interesting. My ride at Harris totaled about 9.5 miles. So far this quest to ride the Tetractus trails is proving to be a lot of fun! I’m looking forward to the next trails! If you’re paying attention you noticed my map also has the Wendell Falls trail system stamped now. That adventure deserves a post all its own. Stay tuned!